Here's some games news that may interest you this weekend. 7th software aka Steve Revill has developed Moan, a new card game for one to four players. Each round, players are given a task to complete, such as 'get two sets of three of a kind' and the first to complete ten challenges wins - quite a fun diversion that needs just as much luck as skill. The game costs just under 15 quid and a free demo is available for download. Rik Griffin has kindly re-released his previously commercial game Tanks for free, and you can download a copy from his website. The idea of the game is to take turns firing missiles and other weapons at other players by carefully aligning your tank's turret and setting the right amount of fire power to ensure you hit your target dead on. It's an addictive game of patience, if you forgive the 'programmer art' 1990s graphics. 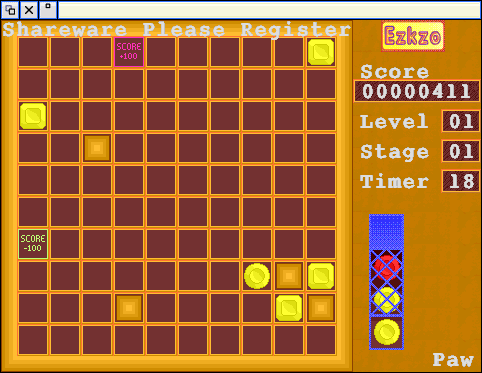 Neil White has developed SDL powered ezkzo, a game in which you must combine gems into patterns within a timelimit to score points. The game is shareware and Neil is eager for your feedback. Ian Macfarlane has produced a puzzle game of sorts for one or two players, where you must take turns filling in 'hollows' with 'seeds' to win. It's not the easiest game to pick up, but once you get the hang of it, Wari becomes a cunning game of logic and forward planning. It also, as some have noticed, makes good use of the Toolbox and anti-alised fonts for the in-game animations. Also, a few utilities by Acorn era group Doggysoft including a game hacking tool and a puzzle game have been released for free online, reports AcornArcade. Finally, a rather tenuous link: Dave McEwen says he's now put Cineroma on the back-back-burner following the closure of UK games company Argonaut. Free stuff? Quick get it before they change their mind or someone yells "copyright violation"! I'm sure it will. In fact the latest update on David's site says that once he has got settled in at his new job, he may get back up to speed on his projects (one of which must be Cineroma I think). I don't think EliteTNK will ever ne released for RISC OS unless it becomes legal to do so. Besides, there are far better things that David is working on (IMO). Cheers! Lets hope Dave McEwen gets a job soon. The other news is good news. www.acornemus.freeserve.co.uk will keep you uptodate on things. Cheers! Thanks. TNK PC version is available by the way. Duke Nukem would be great - we're really in need of some 3D ports. The last was Quake was it not which was brilliant with its atmosphere etc. Although it'd be nice to see more titles that RiscPC users can play of course, the Iyonix surely is capable of much more! The last was Aleph1. Of course, you're aware of that, because you were asking about it on csa.games. :p Thanks to Alan B. for that. TNK is almost certainly dead, since David Braben came down hard on it (most likely thanks to some idiot finally making it impossible for him to turn a blind eye). In any case, we've got a perfectly good version of Elite without any such legal difficulties. Yes sorry about that, completely forgot. Aleph1 was the last 3D port. Are there any screenshots anywhere? Thanks. Simon - TNK /is/ available for the PC. AW: Sort of, in that it's still floating around out there so can be found if you look hard enough. It's not supposed to be, though, and Christian Pinder has withdrawn it from his site (not even sure if the site is still there). Page generated in 0.1076 seconds.